Paw pads wrapped in white fur. Fluffiness around the neck. A bushy tail. A rounded figure that was the very definition of furball! ――――A certain Japanese girl had been reincarnated into such a fox cub; Milfiria. Milfiria was told to watch the house by her mother, as the mother left for the capital. However, unable to bear with the loneliness and deciding to chase her mother to the capital, Milfiria became lost in a fort protected by strong knights. Well I say that but with only 5 chapters translated, we can't really say much but the whole series gives off a fluffy small animal feeling that makes you wish for a hug, and the narration by our tiny hero makes his actions seem adorable from a "aaaahh how cute." Screw major fights or uber cheat, or political intrigue who needs that when you have small animal cuteness and curiosity. I'm usually not into slice of life, but this one is an exception. The plot is nothing exceptionnal, it's just the cute story of a fluffy baby fox, but for some reason, I can't stop reading it. I like it. The MC is so cute (not that I didn't expect that) I don't have much to say that wasn't in the summary or in some other review, but the story floes and connects. I love this story, it's so cute! I really enjoy reading stories where the MC is Non-Human and this is definitely one of my favorites (I also love the reincarnated stories so this is like killing two birds with one stone). It's also kind of easy to get addicted to reading this particular story, in my opinion, just another reason to love it!!! This novel is a very enjoyable read, so cute and sweet. Seeing the world from the baby fox eyes is really adorable. It is definitely a recommended read for those who want something fluffy to read that is heartwarming. Just having her around brightens up the day for the war hardened soldiers! I look forward to reading more chapters! This is BEYOND adorable! Uuu, I want to hug MC so badly... though, she definitely wouldn't let me. Contrary to the description, though, it's not a girl in a fox cub's body. It's a fox cub with the memories of a girl. The adorable fox part of her holds the reins, and the reincarnated girl part only tries to find excuses for what was done. 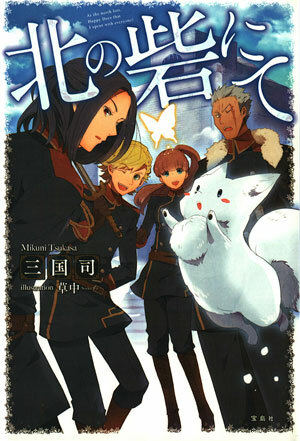 This ticks all the boxes of a well translated, well written, and enjoyable light novel. Dropped by translator for reasons unknown. If someone with the skill level of the original translator would pick this up they could get tons of readers, but it appears to be totally abandoned and forgotten by all but the readers. I really love fluffy story and cute warming one, and this is my second favorite story, I really hope that someone can continue translating this novel. "The stories of a fox, as told by a human." That could very well be the title of this novel. The MC is basically a long lived spirit fox cub and has all of the instincts and actions of a normal fox cub. However, since the MC is a reincarnated human, she can narrate the actions from a familiar viewpoint. There are complaints about how the MC doesn't act like an adult despite mentally being one, but the whole point of the novel seems to be to narrate the life of... more>> a fox cub, and the MC is a reincarnated human only to make this possible in a reasonable way. So the decision to make the MC act like a small animal is very deliberate and coincidentally also very well done. The author needs to write a research paper on the nature of 'cute'. Truly an expert in the field of cuteness, much fluff, so very very cute. You'll need insulin for the sugar overdose, the fuzzball is too dam adorable! What the stupid?... I'm all for stories being cute and fluffy and what not, but I'm sorry.. This is just stupid. It's like the author tried to think up every cute thing they could and jammed it down the throat of this novel. Obviously there's not too much to speak on concerning the story as there aren't many chapters out, but the way it's going... I don't think I'll ever be coming back to it. A very cute and fluffy read. The main character, as a baby fox spirit, is super adorable, and this novel has much potential to give you diabetes with it's cuteness. I always look forward to the next chapter, and I urge anyone who may be interested in the slightest bit to read it and give it a chance. This is one of the novels I'm always waiting for an update. I will just go and directly rate it 5 because I have no doubt that it has great potential. The lead is soooooooooo cute and adorable that I want to reach out and squish her inside my laptop screen. The the flow of the story is so smooth that you can easily visualize everything that is written. The translation is also good. The downside is the slow translation which I can't bring myself to complain since I'm following... more>> the light novels that the translator is focused on translating first which are "I'll Live My Second Life!" and "Kenkyo. Kenjitsu O Motto Ikite Orimasu"--both very good novels. another baby fire spirit (in the raws his name was"Kugargue"), her father (yes! she has a dad! ), AND again Kugargue!!! Kugargue, the baby fire spirit, is mostly detailed in the side chapters called "picture book". It's cute, but the dumbness of the MC makes it really bad. She's 18, but acts like she's 3. I think the author tried to solve this loophole by saying while the MC is 18 mentally, her body's biological functions make her react more animalistically/childishly. However, even so, the MC would catch herself acting too childishly and become embarrassed. If that's the case, this instinct of her to do animal things will eventually be negated by her mind. Yet in the beginning, when her mother left her home for a... more>> month, she decided to stupidly follow her mother even though her mother gave her clear reasons why she couldn't come along (e.g. Human greed), which the MC should know about from her previous life.